The enormous width of the queen’s skirts was rivaled only by the alarming height of her hair. After 1760, women began raising their hair with pads and pomade to a height that towered over their male counterparts. 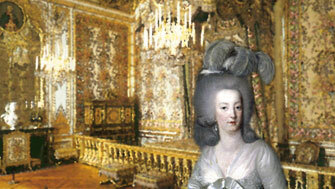 Marie Antoinette took this trend to the hilt, often undergoing elaborate hairdressing rituals that lifted her hair three feet. Even more startling than the height of the hair were the ornaments that decorated it. These included, most controversially, references to current events. The most famous of these was the "Belle Poule," a model of a French frigate or naval vessel of that name.